Babies born today are described as "pre-polluted” with a cocktail of chemicals. We all have over 300 human made chemicals in our bodies that our great grandparents did not. Many substances used to make everyday consumer products are linked to modern epidemics such as diabetes, breast and prostate cancer. Of the 100,000 chemicals used in Europe today, “only a small fraction has been thoroughly evaluated by authorities regarding their health and environmental properties and impacts, and even fewer are actually regulated,” according to a report for the European Commission. Official polls consistently find that Europeans are concerned about chemical exposure. Earlier this month, 2nd April, the United Nations begins three days of talks aimed at finalising chemical safety goals by 2020. Europe committed to these voluntary goals, but the European Commission has acknowledged it will fail these. The European Environmental Bureau (EEB) is Europe’s largest network of environmental organisations, and has provided further evidence of this in it's latest review document. Officials are failing to prevent dozens of dangerous chemicals being used in consumer and other products, according to a review of action by European governments. Around 22,000 chemicals are registered for use in Europe. National authorities began in-depth safety checks of hundreds of substances thought to have dangerous properties in March 2012. By December 2018, high quality checks were completed on 94 substances, of which nearly half (49% or 46) were declared to be unsafe in their current commercial use. The 46 danger substances have been listed for the first time in a review of official records by the European Environmental Bureau, and judged to be a danger due to their harmful properties and exposure threat to people or the environment. The conclution of the investigations was that protective action is needed in all cases, but no action has yet been taken to control 74% (34) of the 46. Lack of resources is a major cause of inaction, NGOs have been told. Industry is legally permitted to use millions of tonnes of the 34 substances annually. The resulting exposure is likely causing cancer, fertility problems or other health impacts, or creating serious environmental pollution, officials found. The programme of in-depth checks by member state officials, known as substance evaluation under a programme called the The Community Rolling Action Plan (CoRAP) specifies the substances that are to be evaluated over a period of three years. The plan is annually updated to include substances for the additional year as well as any revision to the substances that were included in the second and third year of the previous plan. CoRAP, is significantly off course, with just 94 of 352 (26.7%) cases completed by December 2018. This is largely because officials are given inadequate data by chemical companies. Firms are required by EU law to provide high quality safety data. When they do, cases are resolved within a year. Among the hundreds of suspected dangerous substances still waiting for in-depth checks to be completed is Titanium dioxide, widely used in consumer products, but suspected of being carcinogenic and mutagenic. Scheduled for checks in 2013, they remains incomplete while exposure continues. Another is Triphenyl phosphate, a flame retardant and suspected endocrine disrupter found in high concentrations in cars, classrooms, living rooms and offices. It was prioritised for checks in 2013, but postponed 4 years in a row! Throughout the EU REACH chemical control process, very high levels of poor quality and missing data from industry is found. A 2018 progress report by the European Chemicals Agency found that 74% of dossiers had “important safety information” missing under compliance check. “The numbers show a similar picture to previous years” the report said. In 2018, a three year investigation by German authorities found that only a third of substances produced above 1,000 tonnes met the legally mandated safety information. The European Commission has acknowledged the problems and called for thorough reforms. Global chemicals sales more than doubled between 2004 and 2014, are expected to double again by 2030and quadruple by 2060. 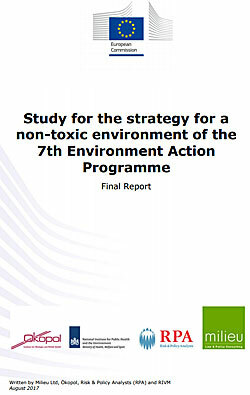 Some 60 percent (by tonnage) of the chemicals on the European market are considered hazardous for health and the environment, according to a report (page 17) for the European Commission. “This is very concerning. Millions of tonnes of dangerous substances are being used unsafely in consumer and other products and getting into the environment. It can take over a decade for officials to protect us, largely because companies fail to provide sufficient safety information. Is it really too much to expect good data from an industry worth €500 billion a year in Europe? It claims safety is a priority. The facts suggest it is not. “It is clear the EU system lets chemicals onto the market too easily and then struggles to get the genie back in the bottle. Companies should face a much higher bar to market entry and also face losing market access if their data is found to be shaky, as is so often the case. For their part, officials need to chemical safety a much higher priority.